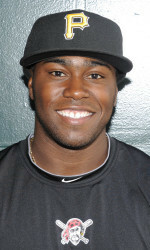 Josh Harrison is a former baseball standout at Princeton High School and University of Cincinnati. Over Memorial Day weekend, Harrison was called up to make his MLB debut for the Pittsburgh Pirates in their game Monday night vs. the Mets. Harrison, 23, set the tone for what would become an illustrious college and minor-league career during his senior year at Princeton High School. During the 2005 campaign, Harrison led the Vikings with a .448 average, to go along with 15 doubles and 23 RBIs. He earned his ticket to the “The Show” after ranking fifth in the International League with a .321 average to go along with eight doubles, two triples, two home runs, 11 RBIs in 37 games this year. Since his minor-league career began in 2008, the infielder has hit .307 to go along with 84 doubles, 14 home runs, 170 RBIs and 75 stolen bases. The Chicago Cubs drafted Harrison in the sixth round with the 191st pick in 2008. He was traded to the Pirates, along with Kevin Hart and Jose Ascanio in exchange for John Grabow and Tom Gorzelanny on July 30, 2009. While at UC (2006-2008), Harrison dominated Big East pitching. He ended his collegiate career ranked among the top 10 in batting (4th, 358), runs (3rd, 192), hits (4th, 246), RBIs (5, 153), total bases (5th, 366), and stolen bases (2nd, 63). In his final season at UC, the 5-foot-8 righthander helped lead the Bearcats to a school-record 39 wins. He was named Big East co-Player of the Year after batting .378 with 90 hits and 22 doubles during the 2008 campaign. Congratulations to Josh and good luck in the big leagues!